The day began with an early morning with breakfast at 7am. Fueled up, we headed to Carrillo Elementary to lead a lacrosse clinic for the students of the school. We began with throwing, catching, and practicing ground balls. Then we split into teams and scrimmaged, and the kids showed tremendous progress. We said goodbye and headed to the beach for surfing lessons. We practiced our surfing “skills” on land with the instructor and then headed out the ocean. Some of us had a rough start and trouble maintaining balance on the board, but by the end we were all able to ride waves to the shore. But it couldn’t have been a pure Costa Rican experience if it didn’t start raining on us while surfing in the 85 degree ocean. After surfing we headed to lunch, right up the street. After lunch we walked back to the hotel to change for our community service project at Samara Elementary. 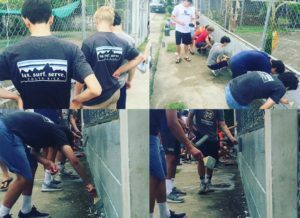 We spent about two hours there painting and cleaning the wall in front of the school. Drenched again, this time in sweat, we made our way back to the hotel hanging flyers and passing them out advertising for our game against the Costa Rican national team tomorrow. Freshened up, we headed to dinner where we ate authentic and delicious Costa Rican food. We got back in the bus and took a drive to the Buena Vista Turtle Sanctuary. There, we got to see the release of baby turtles into the ocean under the bright moonlight. We also saw a mother turtle lay her eggs in the sand and then head back to the ocean to find another mate. Tired yet very satisfied with the day, we drove back to the hotel for a good night’s rest.